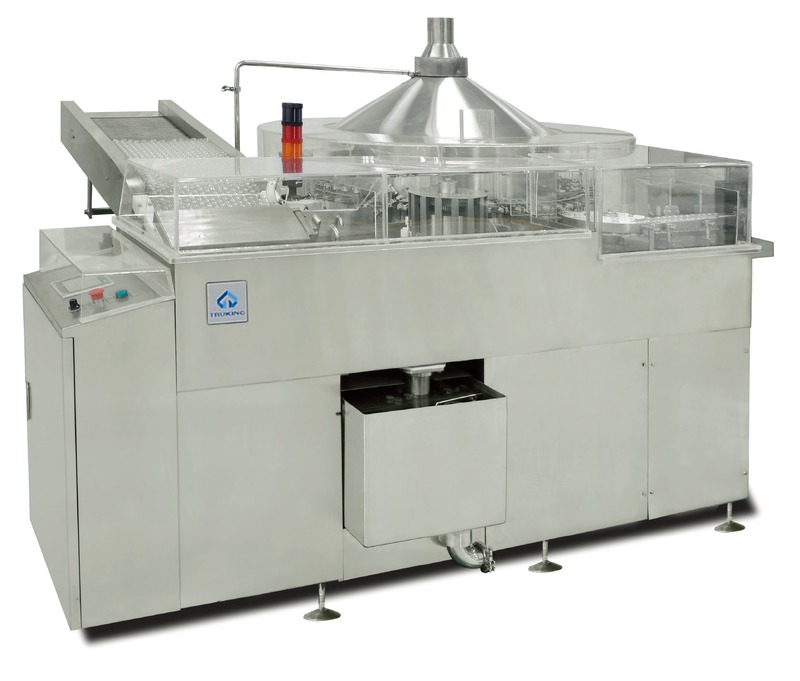 This machine is mainly used for washing of vials in pharmaceutical factories, it also can be used for washing glass containers such as ampoules and oral liquid bottles. This machine use vertical gyration structure. It adopts the way of clamping and overturning bottles with manipulator and the principle of ultrasonic cleaning and washing by alternant jetting water and airflow to clean the containers one by one. The major characteristics: circulation water, compressed air and WFI are using independent needle, without cross contamination. Needles are inserted bottles for flush, there is no water or air loss, saves energy, and has good washing effect. It can observe whole washing process, convenient for operation and maintenance. For Series B washing machine, an additional air flushing and silicone flushing stations are designed. Vials are inputted through conveying belt, slide into the pool after infusing water, then are washed through ultrasonic about one minute. The screw separates vials and sends vials to lifting device. The screw is designed according to best curve, make vials conveyed from screw to lifting device smoothly. Lifting device lifts vials smoothly from water and conveys to manipulators of rotary drum. Manipulators clamp vials and turn 180o, in order to enter following washing station. First step, high-pressure circulating water flush the exterior wall of vials, then the first group of needles insert into vial and flush circulating water, the second group of needles flush circulating water, the third group of needles flush compressed air, discharge residual circulating water. The fourth group of needles flush inject water, the fifth, sixth group of needles flush compressed air, discharge residual water at most in order to dry. Finally flush compressed air to exterior wall of vials. Manipulator turnover vials and sent to output device, then conveyed to tunnel or output plate through output starwheel. The whole washing process is finished. It adopts chain mesh belt, and the height of belt can be adjusted, vial infeed is stable. We adopts numerical control to make mesh belt, uniformity of mesh hole and smoothness of belt are good. Conveyor belt size: 1300mm×360mm, main material SS304. It adopts the ultrasonic washing method. It is equipped with water spraying device at vial infeed station. Vials are filled with water, then are sent to rough washing tank, which can prevent vials from floating, and guarantee washing effect. Ultrasonic power is 600w, and can be displayed. The power can be adjusted according to vial specification and status. The water temperature of tank is heated by two 4.5kw electric heaters, there is temperature controller to control and the temperature can be displayed, guarantees best washing temperature of ultrasonic cleaning at 40-60℃. Rough washed vials are sent directly to the manipulators of the big rotary drum through screw conveyor and lifting device, and are clamped at vial neck to enter fine washing. It adopts lengthen gradually changing type screw, which is good for transfer of vials, and can reduce vial falling, breaking, vial absence effectively. The installation surface of lifting cam shaft，output wheel shaft and big drum central shaft are formed in one time through large numerical control processing center. It guarantees the balance level of axis and verticality to datum surface, highly improves transmission precision and stability. The manipulators of the big rotary drum structure turn the vials upside down, wash the interior side of vials by three times of water and three times of air, and wash the exterior side of vials by recycling water and compressed air each one time. Rotary structure; clamping, turning over and transiting the vials by manipulators. The flushing of WFI and compressed air is interval type, on and off is controlled by pneumatic diaphragm valve. It begins to wash when the needles are inserted into the inner side of vial, which saves energy. Exterior Washing has two sets of flushing devices for recycling water and compressed air, the flushing pressure can be adjusted. As for small mouth vial, we adopts the newest vial mouth orientation patent technology, needles aim well to center, have no friction to vial interior wall. The guide cover and guide plate adopts separate structure. We adopt the original central oil feeding system. When feeding, the covers don’t have to be dissembled, and the efficiency of oil feeding and lubrication is much better than oil feed by operator. At the same time, it reduces pollution and labor intensity, which will be good for realizing the sterile producing. Main bearings on the machine adopt EZO bearing and IGUS bearing. These bearings have high precision and increase the stability and service life greatly. Equipped with pipe system for inner water and air running. Unmovable circuits for water and air adopt stainless steel rigid tubes, they were welded automatically with technology of no padding and single side welded double sides shaped. They were connected according to the flowing direction of washing medium from higher place to lower place, ensures no residue. At the same time, it marks washing medium and flowing direction on pipeline, meets the sterile producing requirement and standard of FDA and EU. The movable tubes for water and air adopt Toyox brand, they meet the requirement of medical sanitary level. Compressed air, recycled water and WFI for flushing are filtrated through filter, flushed WFI are used as recycled water through pump and filter, reduces water consumption. Compressed air and WFI is filtrated through one grade 10 inch Wenzhou Boao filter, filtration precision is 0.22μm, recycled water is filtrated through three cores Wenzhou Boao filter, filtration precision is 3μm. It increases sampling point at rear end of filter for sampling. Diaphragm pressure gauge are adopted to control the pressure of washing medium, when the pressure of washing medium is lower than the rate value, the pressure gauge will send an order and the equipment will stop automatically, and restart automatically after the pressure back to normal. This structure meets the sanitary requirement. The 2 GAME pneumatic diaphragm valve and 7 manual diaphragm valve, pneumatic control element of FESTO brand to control the on-off of water and air, which saves water and air consumption and decreases the cost. It meets the FDA and EU standard. The needles are made by the special technology invented by TRUKING of which structure is an integrated pipe of SS316L material going to the end of needle holder, and welded by the automatic welding machine. No dead angle exists and meets the requirement of sterile producing. There is safety cover (made of transparent polymethyl methacrylate) in washing part. It can bear high pressure and high temperature and strong impact, whole cleaning process is visible. Vials move out through star wheel. It avoids vial breaking, meets aseptic production request. Single outfeed path and the vials are sent to the tunnel directly. The vials are covered between exit of washing machine and entry of tunnel, material of cover is polymethyl methacrylate. Electric cabinet: together with main machine and be airtight. Electric control panel: together with main machine, and connected with the electric cabinet by wire. Equipped with touch screen, emergency button, it can display the alarm, and reset by manual operation. Interlocking device: interlocking with the downstream Sterilizing & Drying Tunnel and Filling & Stoppering Machine to show the causes of fault, position of fault and simple solution. It is protected through 3 levels password: operator, engineer and administrator.